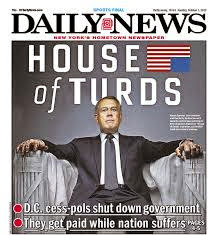 The most talked about headline in the United States today is this-- the New York Daily News tells it as it is. I am writing this to try to explain why there is a government shutdown in the United States for those interested, and why people all around the world need to be concerned about what ultimately may happen. 1. What is the government shutdown in the United States? Basically, all non-essential government services have been closed. This includes United States National Parks and Museums and things like the food and drugs administration and environmental protection agency. Over 800,000 Federal Workers have been send home without pay on furlough. Essential things. The United States military forces are still operating, but their pay may be postponed until further notice. Things like air traffic control remain open. The U.S. Postal Service is run as an independent profit center from the government and remains open. In addition, Americans who receive social security checks who are retired or disabled are still getting their funds. 3. Why is there a shutdown? The U.S. government is not ruled by one party, but by two, who increasingly cannot cooperate with each other. The Democrats, the party of the center - out to the left control the Presidency (President Obama), and the Upper Chamber of Congress, the Senate. The Republicans, who represent the center out to the right of American politics, control the lower chamber of Congress, The House of Representatives. The Republicans have refused to send a budget to the Senate and President Obama to sign that allows funding for Obamacare to go forward without a one-year delay. Obamacare is funded National Health Insurance, through both the private and public sectors, for the 10% of the population which does not have health insurance. Until Obamacare (The Affordable Health Care Act) became the law of the United States, it was the only industrialized country in the world which had no national health insurance. Only Americans over the age of 65 (Medicare) , disabled Americans, and the very poorest of families with dependent children (Medicaid) had national health insurance were offered this. 5. Is medical care in the United States expensive? Yes. The prices for doctors visits, hospitalization, and prescription drugs are the highest in the world. 6. Who pays for health insurance in the United States? Employers of full-time workers traditionally pick up this cost. People who can afford it buy their own health insurance which can be extremely expensive. However, health insurance in the United States, until Obamacare, usually did not cover pre-existing conditions or catastrophic costs such as hugely expensive procedures which require multiple surgeries and which can run over $50,000 to perform. 6, Then how did the 30 million uninsured Americans get health care? If they cannot afford private coverage, they go without it. They must be treated however in hospital emergency rooms which can charge thousands of dollars for simple medical procedures. Bankruptcy, or the loss of all assets, frequently is the only solution for people with high medical bills. These people have life spans that are at least 5 years shorter than Americans who have health care coverage. 7. Have other Presidents tried to implement National Health Insurance in the United States? Yes. All Democratic Presidents in the past 80 years, and some Republican Presidents, have tried to put this through. President Franklin D. Roosevelt was the first in the 1930's, and would have, if he lived to serve his final term in office. President Richard Nixon, a Republican who was forced to resign, was planning to introduce this. Most recently, President Clinton tried to pass national health insurance in the 1990's which his wife, Hillary Clinton led the effort for. However, Congress turned it down. 8. Why is The House of Representatives in Congress turning this down? Isn't it obvious that the Unites States needs something? The Republican Party has been traditionally opposed to comprehensive health insurance. However, they did make some progress in the area. The last Republican President President, George Bush, actually approved expansion of prescription drug coverage for senior citizens. In the past several years, a right wing faction known as the "Tea Party" has seized control of the Republicans. Party. They are radically against providing any more social services to the poor, and even want to end things like Social Security and full medicare coverage to senior citizens. In addition, they are very against gun control, and marriage equality. Although they are not the majority of Republicans, they do go to the polls in high numbers and have removed Republicans who are not to their liking. What the Tea Party has forced Republican leadership in Congress to do is shut down the government unless President Obama and the United States Senate which the Democrats control stall implementation of Obamacare, which may actually end it, since their are elections in the United States in 2014 and 16 coming up. And they realize that once the United States has national health insurance, people will not want to give it up. 9. Why won't President Obama compromise with the Republicans? President Obama's legacy is Obamacare, and he won the last Presidential election with it as a key component. The Supreme Court has upheld the legality of Obamacare earlier this year. It actually is set as the law of the land. The Democrats are willing to negotiate the budget and what is called entitlements with the Republicans, and have made compromises in the past. However, the shut down of the government is viewed by the Democrats, and according to overnight polls by the large majority of Americans, as an unacceptable way to negotiate. 9. When will this crisis end? Probably not for a week at least. It could take much longer. Now here is the scary part. In about two weeks, on October 17, the United States will need to increase its debt limit to pay off interest on stocks and bonds. The United States is still playing the cost of the disastrous Iraq war, and is also paying the close of the bailout of the economy which was necessary due to the collapse of Wall Street under President Bush's administration. The Republicans are indicating that they may not approve a debt limit increase unless Obamacare is postponed. The last time they did this, the United States credit rating fell permanently. What is very scary is if groups that own the bonds of the United States government feel that the the United States will not pay the interest due them, including most notably the government of China, a world wide recession may occur. The United States has never defaulted in its debt. And Congress has never used this as a negotiating tool. Great article. You explain this crises very well. Thanks. That is great. I love politics and am also a Democrat, but like to listen to and know what both sides think.